This smaller 14K yellow gold Claddagh ring has a puffed heart along with a heavy weight design that would be suitable for a child or a women with smaller fingers. The child's gold Claddagh ring measures 5/16" (just under 3/8") tall from the top of the crown to the bottom of the heart. 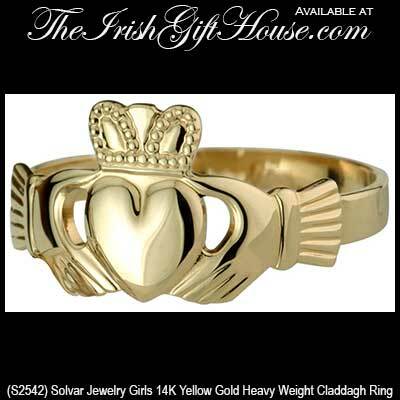 This gold Claddagh ring is available in sizes 4 through 9.5, including half sizes.